Background: Faculty members are crucial elements of an educational institution, and their job satisfaction is likely essential for success of the educational process. Leadership support, work conditions and perceived job security could be factors affecting academic job satisfaction. Objective: The aim of the study was to investigate the effect of leadership support, work conditions and perceived job security on the overall academic job satisfaction of faculty. Materials and Methods: A cross-sectional survey, using a structured questionnaire, was conducted to determine the effect of leadership support, work conditions and perceived job security on academic job satisfaction among faculty and teaching staff at the College of Medicine, Imam Abdulrahman Bin Faisal University, Dammam, Saudi Arabia. Multiple regression analysis was performed to examine the significance of these relationships at 95% confidence interval and P < 0.05 level of significance. Results: Leadership support (β = 0.187, t = 2.714, P= 0.007), work conditions (β = 0.199, t = 2.628, P= 0.009) and perceived job security (β = 0.264, t = 3.369, P= 0.001) were found to be significantly associated with overall academic job satisfaction. Conclusion: The results of this study support the hypothesis that faculty and teaching staff working with supportive leaders and favorable work conditions as well as having an optimized sense of perceived job security demonstrate significantly higher levels of overall academic job satisfaction. These findings provide input for policymakers, and their implementation could enhance an institution's vitality and performance, and thus enable it to fulfill its goals. Higher education in Saudi Arabia is undergoing major developmental changes. Inevitably, this has resulted in increased accountability among faculty with respect to productivity and time management, which in turn has increased work pressure. Faculty members are pivotal elements of an educational institution, and their motivation and job satisfaction are likely to be essential requirements for any successful educational process. Job satisfaction is an elusive notion that has been increasingly disputed and refined. Since the late 1950s, numerous theories and models have been developed in an attempt to explain the essence and causes of job satisfaction. Herzberg et al. proposed that job satisfaction was two dimensional, with certain factors leading to job satisfaction and others causing dissatisfaction. In 1968, Herzberg refined the dual-factor theory and postulated that only aspects related to job content (e.g., achievement, responsibility and the work itself) contribute to job satisfaction, while aspects related to job context (e.g., salary, job security and work conditions) can cause job dissatisfaction but not satisfaction. More recently, Quarstein et al., in their “situational occurrence theory” of job satisfaction, expounded that job satisfaction is driven by two factors: “situational occurrences” and “situational characteristics.” The theory contends that both or either of these factors can cause overall job satisfaction or dissatisfaction. In terms of job satisfaction among faculty in a university setting, different sets of factors tend to dominate the equation. Pearson and Seiler asserted that “higher order” needs are at stake for university faculty, especially because academics usually exert considerable control regarding job “content” factors such as the teaching and learning process and molding students' minds. On the other hand, faculty members usually have minimal control over “context” factors, such as the work conditions where teaching and research are taking place. The authors concluded that because of the degree of control that faculty members have over “content” elements, their degree of satisfaction is mostly dependent on “context” factors. Similarly, Hill appraised the usefulness of Hertzberg's “dual theory” for assessing faculty job satisfaction in higher education. He contended that major causes of satisfaction among university faculty would likely be intrinsic factors such as teaching, research and scholarly activities and the nature of their work itself. In contrast, major causes of dissatisfaction would likely be extrinsic factors such as pay, benefits, administrative support, work conditions and relationship with colleagues. Previous research on the work life of faculty has studied the effect of factors such as motivation, rewards and salary, productivity, instructional and learning technology and gender or minority issues. However, there is limited understanding of the effect of institutional and professional issues on faculty members' overall job satisfaction, as few studies have concurrently examined the impact of leadership support, work conditions and perceived job security on their overall job satisfaction. This study aims to examine these three key dimensions and determine their influence on overall job satisfaction among academic faculty at a medical college in Saudi Arabia. A quantitative cross-sectional design was used to determine the effect of leadership support, work conditions and perceived job security on overall job satisfaction among faculty and teaching staff at the College of Medicine, Imam Abdulrahman Bin Faisal University, Dammam, Saudi Arabia. Ethical approval for the study (reference no. IRB-2018-01-148) was obtained from the Institutional Review Board of Imam Abdulrahman Bin Faisal University, Dammam, Saudi Arabia. Clustered random sampling was used for this study. The study was carried out between May 2016 and March 2017. The study questionnaire was distributed to faculty (professors, associate professors and assistant professors) and teaching staff (lecturers and demonstrators) through the chairpersons of all 23 departments. Using computer-generated random numbers, faculty and staff were randomly selected and invited to voluntarily participate in the study. The academic job satisfaction survey was carried out as part of the requirements for program academic accreditation. The Academic Job Satisfaction Questionnaire, which was developed and validated in an earlier study by Al-Rubaish et al., was utilized in this study. The structured questionnaire is composed of two parts. The first part consists of eliciting demographic data such as age, gender, qualifications and duration of service. The second part consists of 46 items subdivided into 11 domains including that of leadership supervision, work conditions and perceived job security. At the end of the questionnaire, one item asked respondents to rate their overall job satisfaction. All items were scored on a 5-point Likert scale (1 = strongly disagree and 5 = strongly agree). Data entry and analysis were performed using Statistical Package for the Social Sciences version 21 (IBM Corporation, Armonk, NY, USA). Descriptive statistics and multiple regression analysis were utilized. The level of significance was 95% confidence interval (CI) and P < 0.05. Factor analysis and Cronbach's alpha coefficient test were conducted to test the validity and internal consistency of the study instrument, respectively. The value for the study variables was >0.70, which is considered a satisfactory level for Cronbach's alpha coefficient. Mahalanobis D2 statistics was used for determining outliers. If Mahalanobis D2 exceeded the chi-square critical value, respondents were considered as outliers. At P = 0.001 significance level and 52 degrees of freedom, the chi-square critical value of the study was 89.27; respondents reaching this critical value were omitted from the study., Independent sample t-test and one-way ANOVA test were utilized to compare differences in job satisfaction between the study participants according to their gender, position and qualifications. Of the total 466 faculty and teaching staff members at the College of Medicine, Imam Abdulrahman Bin Faisal University, 286 were randomly selected to participate in the study. A total of 220 respondents returned the questionnaire, representing a 78.6% response rate. Missing data were replaced by the mean. Data were cleaned and a total of 15 (6.8%) respondents were considered outliers and omitted from the study. Therefore, all further analyses included 205 respondents. 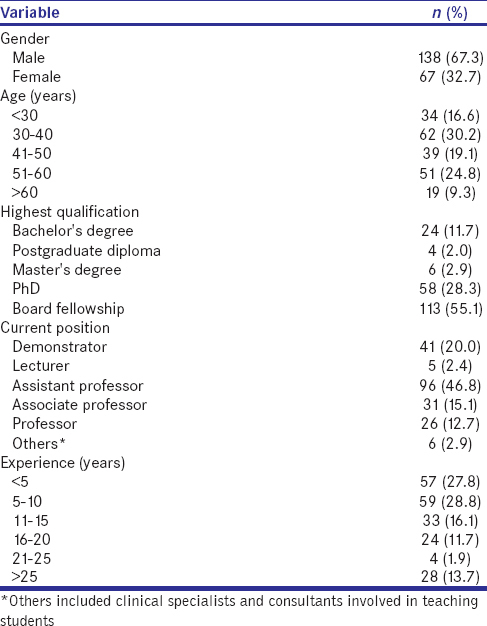 Of these, 138 respondents were males (67.3%; male: female ratio = 2:1) and most were assistant professors (46.8%) [Table 1]. Independent samples t-test indicated insignificant differences in the academic job satisfaction scores for males (M = 3.95, standard deviation [SD] = 0.92, standard error [SE] = 0.08) and females (M = 4.07, SD = 0.70, SE = 0.09; t [−0.96] = 1.62, P = 0.34, two-tailed) at P < 0.05 [Table 2]. The differences in the means (mean difference = −0.12, 95% CI: −0.38–0.13) were negligible (η2 = 0.0045). One-way ANOVA results indicated insignificant differences between the participants in terms of position (mean square = 0.80, F = 1.08, P = 0.37) and qualification (mean square = 0.32, F = 0.43, P = 0.78) at P < 0.05 [Table 3] and [Table 4]. Academic job satisfaction among faculty and teaching staff was found to be significantly associated with leadership support, work conditions and perceived job security at P < 0.001 (F = 26.752; P = 0.000) [Table 5]. The value of R2 indicates that these variables predicted 0.285 variances of academic job satisfaction among faculty and teaching staff at the College of Medicine, Imam Abdulrahman Bin Faisal University. Leadership support (β = 0.187, t = 2.714, P = 0.007), work condition (β = 0.199, t = 2.628, P = 0.009) and perceived job security (β = 0.264, t = 3.369, P = 0.001) were found to have significantly positive impacts on academic job satisfaction at P < 0.01. These findings indicate that faculty and teaching staff with a greater leadership support, better work conditions and perceived job security by one SD had greater job satisfaction by 18.7%, 19.9% and 26.4%, respectively. This study found that faculty with higher leadership support by one SD had greater job satisfaction by 18.7%, indicating a positive relationship between leadership support and faculty job satisfaction. This finding is similar to that stated in the “organizational support theory,” according to which an employee's performance improves as a direct result of their superior's support. This, in turn, deepens the employee's commitment and adherence to the goals of the institution and reduces their likelihood of leaving. Similar to our findings and the organizational support theory, Winter and Sarros found that a supportive leadership style and participation in the decision-making process were significant factors in enhancing job satisfaction and, consequently, commitment to the institution among faculty. Similarly, Smerek and Marvin Peterson found that satisfaction with supervisors had one of the strongest impacts on overall faculty satisfaction and was preceded only by the work itself. In South Africa, Bull found that leadership supervision, along with the nature of work, opportunities for advancement and salary, was a critical factor influencing faculty job satisfaction. Shamima et al. also found leadership supervision to be one of the major factors that led to job satisfaction among teachers in Bangladesh. Our results are also consistent with those of Tom et al., who found that in the United States, leadership supervision and interpersonal relationships were among the five intrinsic or “motivator” factors that had significant effects on faculty satisfaction. Staff involvement in the decision-making process constitutes a critical concern in organizational research and is considered a key indicator of organizational performance.,, Traditionally, academic work had largely been self-regulated. However, the autonomy of faculty members has come under significant strain owing to increased managerial authority over work. The degree to which a superior exercises authority over subordinates has been shown to cause stress and burnout. In a university setting, a leader's personality, work ethic, interpersonal relationships and administrative approach have been shown to be important factors that affect the performance of faculty members. Recent initiatives in Jordanian universities have concentrated on increasing the autonomy of faculty and increasing their involvement in the decision-making process. Researchers have indicated that providing autonomy to faculty members results in a sense of engagement and empowerment that allows them to evolve within their profession and seek more responsibilities in line with their status. Accordingly, the authors believe that faculty should be given the freedom to make changes with the assurance that their efforts can make a difference. In addition, efforts should be undertaken to increase the participation of faculty in decision-making, as their ability to make effective decisions is paramount for successful performance of a university. Based on our results and those of previous studies, the authors agree with Winter and Sarros's recommendation that training supervisors to improve their interpersonal and communication skills as well as their decision-making would have a positive trickle-down effect in impacting job satisfaction among both themselves and their faculty. The results of this study demonstrated that faculty having higher satisfaction with their work conditions by one SD had greater overall job satisfaction by 19.9%. Unfavorable work conditions have been shown to be critical factors that cause job dissatisfaction among employees. Several studies have demonstrated that work conditions are particularly crucial factors in determining the overall job satisfaction among academic faculty.,, Our results concur with the findings of Darmody and Smyth's study conducted in Ireland. Their study found that found that along with salary, promotion and fringe benefits, work condition is a major factor impacting the overall faculty job satisfaction. Similarly, our findings also support the results of other studies that have demonstrated a correlation between a healthy work environment and reduced job stress, which in turn significantly enhances the overall employee satisfaction., On the other hand, our results contradict Herzberg's assumption that employees' commitment to the institution and degree of overall satisfaction cannot be enhanced by improving work conditions. The findings of this study revealed that faculty with higher perceived job security by one SD had greater job satisfaction by 26.4%. This factor exerts considerable influence on job satisfaction and supports the “norm of reciprocity” theory, which posits that “positive actions bring about more positive actions while negative actions bring about more negative actions.” The supportive effect of job security on overall job satisfaction is also supported by the “social exchange theory,” which states that human relationships are forged by the use of a subjective cost–benefit analysis and comparison of alternatives. Job satisfaction, primarily a cognitive evaluation that is composed of extrinsic components, is directly influenced by adverse economic conditions. This may be considered important in view of the current global and regional economic crisis, as a negative view of the future would inevitably impact job security, and thus result in job dissatisfaction. Several studies have shown that, in an academic setting, perception of job security results in loyalty of faculty toward their institution, whereas perceived job insecurity results in job dissatisfaction and lower commitment to an organization. Similarly, Ma et al. stated that “the existence of job security is likely to bolster employees' perceptions of organizational support which would in turn help foster organizational commitment.” On the other hand, Chughtai and Zafar argued that job security only had a minor effect on overall job satisfaction compared with other more influential factors such as the primary work undertaken, promotion opportunities, training opportunities and salary. This may indicate that faculty members are more likely to be satisfied with a job that rewards them academically and financially than with a job in which they feel more secure. Overall, it can be stated that because faculty members are essential for the efficient running of an institution, job satisfaction among them inevitably plays a role in the success of an institution. Consequently, this research presents several practical implications. First, job satisfaction is critical not only because of a humanistic desire to enhance the nature of work but also because of its potential effect on an institution's outcomes such as productivity and retention. Hence, administrators concerned with the performance and efficiency of their institution should prioritize this aspect. Second, given the financial constraints to which any college or university is subject, administrators who wisely use the resources of their institutions to impact faculty job satisfaction will, in effect, enhance the overall functioning of the institution. Three dimensions of faculty job satisfaction were considered in this study. However, there are other environmental factors that affect job satisfaction. These include collegial relationships, salary, staffing adequacy and recognition. These factors can be added to the study model and investigated in future research. This study, which had a cross-sectional design and was carried out in the College of Medicine, may be replicated in other settings and a longitudinal, larger sample may be utilized to ensure the causality between the study variables. The results of this study support the hypothesis that faculty and teaching staff working with supportive leaders, in favorable work conditions and having an optimized sense of job security demonstrate significantly higher levels of overall job satisfaction. Therefore, the current study agrees with previous reports showing that factors related to “job context” rather than “job content” are more likely to affect faculty job satisfaction. The findings of this study provide input for policymakers to promote adequate leadership support, favorable work conditions and enhance job security to maintain a satisfied body of faculty and teaching staff, which in turn could optimize the institution's vitality and performance and enable it to fulfill its goals. Smith L, Abouammoh A. Higher Education in Saudi Arabia: Achievements, Challenges, and Opportunities. New York: Springer; 2013. Matier MW. Retaining faculty: A tale of two campuses. Res High Educ 1990;31:39-60. Herzberg F, Mauser B, Snyderman B. The Motivation to Work. New York: John Wiley; 1959. Herzberg F. Work and the Nature of Man. London: Staples Press; 1968. Quarstein VA, McAfee RB, Glassman M. The situational occurrences theory of job satisfaction. Hum Relat 1992;45:859-73. Pearson DA, Seiler RE. Environmental satisfiers in academe. High Educ 1983;12:35-47. Hill MD. A theoretical analysis of faculty job satisfaction/dissatisfaction. Educ Res Q 1986;10:36-44. Anthun KS, Innstrand ST. The predictive value of job demands and resources on the meaning of work and organizational commitment across different age groups in the higher education sector. J High Educ Policy Manage 2016;38:53-67. Olsen D, Maple SA, Stage FK. Women and minority faculty job satisfaction: Professional role interests, professional, satisfactions, and institutional fit. J High Educ 1995;66:267-93. Al-Rubaish AM, Rahim SI, Abumadini MS, Wosornu L. Academic job satisfaction questionnaire: Construction and validation in Saudi Arabia. J Family Community Med 2011;18:1-7. Pallant J. SPSS Survival Manual. 4th ed. British Library; 2011. Available from: http://www.scholar.google.com/scholar?hl=en& btnG=Search&q=intitle: SPSS+Survival+Manual#7. [Last accessed on 2014 Oct 22]. Hair J, Tatham R, Anderson R, Black W. Multivariate Data Analysis. 7th ed. New Jersey, Pearson Prentice Hall; 2010. Tabachnick B, Fidell L. Using Multivariate Statistics. 6th ed. London Pearson Education; 2013. Stevens JP. Applied Multivariate Statistics for the Social Sciences. 5th ed. New York and London, Taylor and Francis Group; 2009. AbuAlRub R, El-Jardali F, Jamal D, Abu Al-Rub N. Exploring the relationship between work environment, job satisfaction, and intent to stay of Jordanian nurses in underserved areas. Appl Nurs Res 2016;31:19-23. Al-Hamdan Z, Manojlovich M, Tanima B. Jordanian nursing work environments, intent to stay, and job satisfaction. J Nurs Scholarsh 2017;49:103-10. Alonderiene R, Majauskaite M. Leadership style and job satisfaction in higher education institutions. Int J Educ Manage 2016;30:140-64. Winter R, Sarros J. The academic work environment in Australian universities: A motivating place to work? High Educ Res Dev 2002;21:241-58. Smerek RE, Marvin Peterson M. Examining Herzberg's theory: Improving job satisfaction among non-academic employees at a university. Res High Educ 2007;48:229-50. Bull IH. The Relationship between Job Satisfaction and Organizational Commitment amongst High School Teachers in Disadvantaged Areas in the Western Cape (Doctoral Dissertation, University of the Western Cape); 2005. Shamima T. “Job Satisfaction among Female Teachers: A Study on Primary Schools in Bangladesh”, M. Phil Thesis, Department of Administration and Organization Theory University of Bergen, Bergen; 2006. Tom WS. Job Satisfaction in the United States. Chicago, IL: NORC/University of Chicago; 2007. Adenike A. Organizational climate as a predictor of employee job satisfaction: Evidence from covenant university. Bus Intell J 2011;4:157-66. Rad GP, Esfahani ZG, Miandashti NZ. Investigation of Leadership Style Correlates Affecting Jihad-e-Keshavarzi Staffs Job Satisfaction in Yazd. J Agric Sci Technol 2008;10:421-9. Greenberg J, Baron RA. Behavior in Organizations. New Jersey: Pearson; 2011. Choi SP, Cheung K, Pang SM. Attributes of nursing work environment as predictors of registered nurses' job satisfaction and intention to leave. J Nurs Manag 2013;21:429-39. Arah OA, Hoekstra JB, Bos AP, Lombarts KM. New tools for systematic evaluation of teaching qualities of medical faculty: Results of an ongoing multi-center survey. PLoS One 2011;6:e25983. Taqatqa MR, Abu-Ghazaleh T, Aljbour RH. Jordanian faculty members: Will autonomy increase work engagement? Eur Med J Manage 2017;2:164-81. Flowers VS, Hughes CL. Why employees stay. Harv Bus Rev 1973;51:49-60. Darmody M, Smyth E. “Job Satisfaction and Occupational Stress among Primary School Teachers and School Principals in Ireland”, ESRIA Report Compiled by the ESRI on Behalf of the Teaching Council, Dublin; 2010. Joarder MH, Sharif MY. Faculty turnover in private universities in Bangladesh: The tripartite investigation. Int J Soc Sci Econ Art 2011;1:118-23. Schmalenberg C, Kramer M. Essentials of a productive nurse work environment. Nurs Res 2008;57:2-13. Herzberg F. One More Time: How do You Motivate Employees? UK: Harvard Business Review Case Services; 1987. Gouldner AW. The norm of reciprocity: A preliminary statement. Am Soc Rev 1960;25:161-78. Huang YH, Lee J, McFadden AC, Murphy LA, Robertson MM, Cheung JH, et al. Beyond safety outcomes: An investigation of the impact of safety climate on job satisfaction, employee engagement and turnover using social exchange theory as the theoretical framework. Appl Ergon 2016;55:248-57. Chang E. Employees' overall perception of HRM effectiveness. Hum Relat 2005;58:523-44. Samuel MO, Chipunza C. Employee retention and turnover: Using motivational variables as a Panacea. Afr J Bus Manage 2009;3:410-5. Ashford SJ, Lee C, Bobko P. Content, cause, and consequences of job insecurity: A theory based measure and substantive test. Acad Manage J 1989;32:803-29. Ma B, Liu S, Liu D, Wang H. Job security and work performance in Chinese employees: The mediating role of organisational identification. Int J Psychol 2016;51:123-9. Chughtai AA, Zafar S Antecedents and consequences of organizational commitment among Pakistani university teachers. Appl HRM Res 2006;11:39-64. Johnsrud LK, Heck RH, Rosser VJ. Morale matters: Midlevel administrators and their intent to leave. J High Educ 2000;71:34-59.